? Anztan defensive facilities destroyed or disabled. Most Anzatan Guardian Cruisers and fighter squadrons disabled. 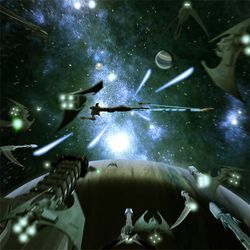 The Battle of Ingo was the final engagement in Horizon Warlord Venom Kazvar's campaign against various outlying star systems and governments. Having previously raided the orbit of Cona, attacked the manufacturing stations of Nisshutsu Shipyards, and annexed the Starvengers, Kazvar had set his eyes on the New Anzat Order. The Warlord planned and executed an attack on the Ingo system utilizing his formidable naval forces, spearheaded by his modified Modular Taskforce Cruiser Xenon and several Carrack/I-class Light Cruisers. His intent was to destroy all non-relevant defending vessels and disable the rare Guardian Medium Cruisers. Foiled by the intervention of a massive coalition fleet, Kazvar abandoned his subordinates in the middle of the battle and fled. His disappearance brought an abrupt end to Horizon's expansionist plans, and triggered the decline of conglomerate's status as a prominent galactic power. Although Kazvar would later return to take the reins of Horizon once more, he never succeeded in restoring the interstellar standing and power of his corporations. This page was last edited on 21 August 2013, at 21:26.